In 1961, astrophysicist Frank Drake developed an equation to estimate the number of advanced civilizations likely to exist in the Milky Way galaxy. The Drake equation has proven to be a durable framework for research, and space technology has advanced scientists’ knowledge of several variables. But it’s been impossible to do anything more than guess at variables such as L, the probable longevity of other advanced civilizations. In new research, Adam Frank, a professor of physics and astronomy at Rochester, offers a new equation to address a slightly different question: What is the number of advanced civilizations likely to have developed over the history of the observable universe? Frank’s equation draws on Drake’s, but eliminates the need for L.
Are humans unique and alone in the vast universe? It’s a question humans have asked for millennia. But it hasn’t been until recently that there’s been any scientific framework in which to even begin to posit answers. In the early 1960s, astrophysicist Frank Drake, now professor emeritus of astronomy and astrophysics at the University of California, Santa Cruz, developed an equation that could theoretically estimate the number of advanced civilizations existing in the Milky Way galaxy. Drake intended his equation to offer a guide for research. At the time, astrophysicists didn’t have nearly the knowledge it would actually take to come up with a value for the elusive N: the number of advanced civilizations (which Drake defined in practical terms as civilizations emitting detectable electromagnetic waves) that were likely to inhabit the galaxy. Among the unknowns was the number of planets in the Milky Way. And as long as that was unknown, it would also remain unknown what percentage of such planets—or exoplanets, as they’re called—would likely have environments suitable for life. Scientists have made enormous progress toward estimating both of those variables, thanks to NASA’s Kepler Mission and other advances in astronomy. The Kepler space observatory was launched in March 2009 with the goal of exploring the Milky Way’s planetary systems in order to find habitable planets. Using data from that mission, astrophysicists can now achieve reliable estimates for both those variables. And in new research, Adam Frank, a professor of physics and astronomy at Rochester, and his coauthor Woodruff Sullivan of the University of Washington have advanced a means to overcome the obstacles. But the Drake equation requires an estimate for how often planets suitable for life actually develop life. Second, it requires an estimate for how often life evolves into intelligent life, and how often intelligent life develops into advanced civilization. And most troublesome of all, according to Frank, the Drake equation requires an estimate for how long advanced civilizations are likely to persist. “The fact that humans have had rudimentary technology for roughly 10,000 years doesn’t really tell us if other societies would last that long,” Frank says. By restating the question, Frank and Sullivan eliminate the need to know any information about civilization longevity. Frank calls the new question the “cosmic archaeological question”—how often in the history of the universe has life evolved to an advanced state? Of course, that still leaves huge uncertainties in calculating the probability for advanced life to evolve on habitable planets. It’s here that Frank and Sullivan flip the question around. 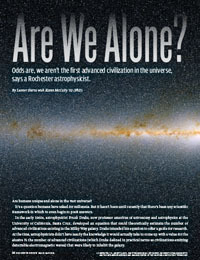 Rather than guessing at the odds of advanced life developing, they calculate the odds against it occurring. In other words, what are the odds that humanity, here on Earth, is the only advanced civilization ever to develop in the entire history of the observable universe? So how unlikely is it in a universe consisting of an estimated 10 billion trillion stars, or even among the Milky Way’s estimated 100 billion? Applying the new exoplanet data to the universe’s 2 • 10 to the 22nd power stars, Frank and Sullivan find that human civilization is unique in the cosmos only if the odds of a civilization developing on a habitable planet are less than about one in a trillion trillion, or one in 10 to the 24th power. But that reality doesn’t diminish the profound scientific and philosophical significance of the new result.